Chester Croquet Club held their annual Christine Long handicap golf tournament on Saturday, 15 September. Eight members took part in a round robin format and enjoyed a full day’s competition. There were many closely fought games with James Thomas emerging the outright winner with 6 wins out of a possible 7. Roger Haigh was runner up and Paul Taylor a close third. Taking part were, Mel Hagan, Pat Wheeler, Paul Taylor, James Thomas, Roger Haigh, Chris Thomas, Liz Subramanian, and Janet Jackson. Participants in Chester’s annual Christine Long handicap golf croquet tournament with the winner, James Thomas, in the centre, the runner-up Roger Haigh, centre right back row, and in third place Paul Taylor, centre left. On the same day, Chester played away against Bury in the NW full lawn handicap league. The Chester team of David Boyd (captain), David Guyton, Brian Walton and Paul Watson faced a meteorologically and metaphorically damp start to the day losing the doubles and both singles matches in the morning resulting in the team being 0 – 3 behind by lunchtime. 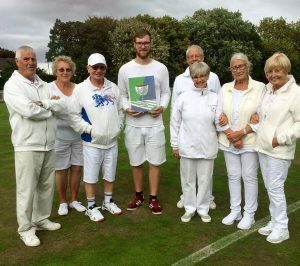 The weather and performance brightened in the afternoon with Chester winning three of the four singles games giving a final 4 – 3 win to Bury.